On a recent trip to our local green grocer, I discovered a crate of beautiful Kent Pumpkins on sale. The days have been cooling considerably in the late afternoons as we transition from Summer to Autumn and so I decided on the spot that I would prepare a quick pumpkin soup for dinner. I squeezed a whole pumpkin into my red shopping basket and proceeded to the checkout, feeling the pleasing warmth that comes from the early whispers of a new season. Place the chopped pumpkin, garlic, finely grated nutmeg and stock into a large saucepan and boil for 15 to 20 minutes. Once pumpkin is soft (test with a fork), blend the soup until thick and smooth, season to taste. Serve immediately with a dollop of cream or natural yoghurt and a sprig of fresh parsley, sprinkle with freshly cracked black pepper. I've previously added a small brown onion to this recipe and it tasted warm, savoury and delicious, however it is not necessary and cuts down on preparation time. I also used a ThermoChef, instead of a saucepan. All I did was place the pumpkin, garlic and enough stock to cover the pumpkin (approximately 3 cups) into the ThermoChef, set the temperature to 100 degrees Celsius (210 degrees Fahrenheit) and set the timer to 20 minutes. I then went for a jog on the beach with the puppy in the late afternoon. When I returned, the soup was cooked so I showered, then poured off some of the excess stock into a bowl and blended the soup in the ThermoChef (less washing up equals more time to relax). You can always add more of the hot liquid stock to the soup later to make it less viscous, this is how I achieve the consistency that I want. I add the excess stock sparingly as I love my soup thick! I poured the soup directly into a large soup mug and in my pictures I have dolloped natural yoghurt on the top and garnished the soup with Italian parsley from my herb garden. I then toasted two slices of gluten free bread and slathered a tiny amount of unsalted butter onto each hot, crunchy piece to plunge into my soup. The soup was warm and inviting, the perfect pick-me-up after a gentle run across the wet sand. As the sun dipped low in the sky, I slowly savoured each spoonful whilst the puppy lay at my feet, sleeping soundly. I would have to say that kent pumpkins are my favourite to use in pumpkin soup, unless I'm roasting the pumpkin beforehand, in which case I sometimes like to use the sweet, nutty flesh of butternut squash. If you choose to roast your vegetables beforehand, preheat your oven to 180 degrees Celsius and on a baking tray, coat the chopped pumpkin, crushed whole garlic cloves and roughly chopped brown onion in one tablespoon of olive oil. Roast the vegetables until golden, approximately 15 minutes, then combine in a heavy based pot with enough vegetable stock to cover the pumpkin. Finely grate 1/8 to 1/4 teaspoon of fresh nutmeg into the pot and bring to the boil. Reduce heat to a simmer until the vegetables are tender, then blend the vegetables and half of the stock until smooth. Pour in the remaining stock sparingly to achieve the consistency you desire. I prefer a thick soup, as pictured. Season with sea salt and cracked pepper to serve. No matter what kind of pumpkin you decide to use, the end result will be healthy and filling and if you're lucky, you'll have enough pumpkin infused stock left over to flavour a lovely pumpkin risotto. The options are only as limited as your imagination. Sitting in an old favourite chair on a broad verandah opposite the sea, my pumpkin soup in a large mug warming my fingers. Simplicity in all it's beauty. You may have noticed that the soup mug I used is the same as the one featured in our giveaway. 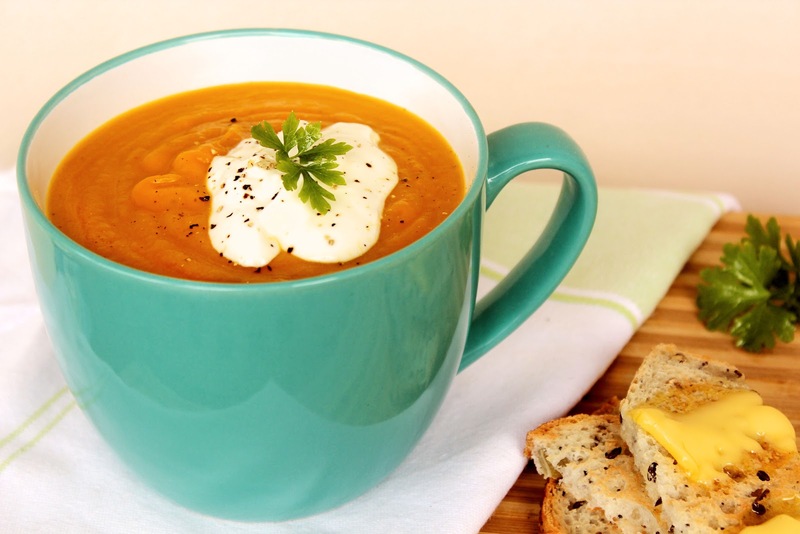 When I stood in a brightly lit store all those weeks ago searching for the ideal gifts to include in my giveaway, it was pumpkin soup that I imagined ladling into the teal coloured mug. I purchased an extra one for myself because I love the deep blue-green colour, especially when partnered with the glossy orange of this soup. A gentle reminder that the giveaway will finish at the end of February. To enter, visit here and follow the instructions. Entry is free and you can enter up to seven times. Good luck dear fiends! 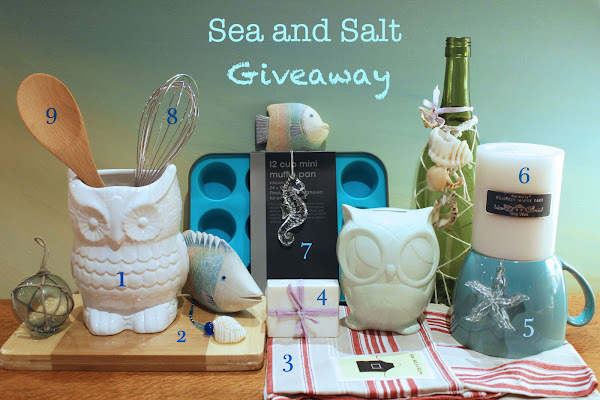 In other giveaway news, the lovely Jodi over at Che and Fidel is sharing details for yet another giveaway on her blog. The handmade items for the home and nursery have been generously donated by Melbourne based artist Madeleine Sargent of Made by Mosey and the link for that giveaway can be found by visiting here. Let the sharing continue in our wonderful online community! Thanks for popping in for dinner, as always I love to share it with you. This soup looks delicious, Bella. I will be trying your recipe as soon as the weather turns up here! I'm looking forward to layers and scarves and cup of steamy pumpkin soup already. Hope you're having a lovely weekend, lady. Thank you Sar, my weekend has been perfectly relaxing thus far. I like layers too. There's something special about wrapping a soft scarf around my shoulders and neck when the evenings cool. I'm really enjoying your money saving ideas and beautiful recipes. So kind to the environment. Bella! I made this soup tonight and it is amazing! I added a stick of celery (as it was on its way out) and chives to garnish. It's been rainy and cold today so I'm curled up on the couch, listening to Sam jam with her friend and enjoying this delicious soup. Hope you are having a lovely week, lady! That's great! I often find that using things that are 'on their way out' can really enhance recipes. I used to go a bit overboard when shopping. I'd purchase all these fresh yummy ingredients with wonderful ideas of what to make and after storing them, I'd sometimes forget they were in the fridge! We shop smarter these days and try to use everything, with minimal waste. It saves lots of money! 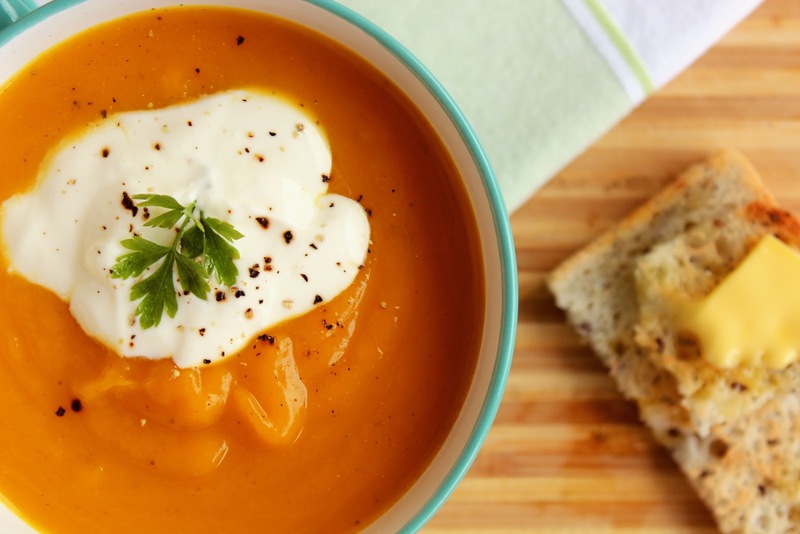 I think rainy days with pumpkin soup and wonderful company sounds like the prefect way to enjoy the indoors. Thanks for sharing Sar! Yum! That sounds and looks so delish! Bella your writing is so evocative, love the colour if the cup too, teal is my favourite to. Delicious and perfect for an almost autumn night! I prefer my pumpkin soup thick too so will try your method for tipping off a bit of excess stock next time. I was admiring your soup mug... such a lovely colour. Do you know what brand it is? Thank you and of course I love your 'almost autumn night' description. We used the excess stock to help flavour a pumpkin risotto, though I don't recall if I took pictures of it, will simply have to make it again! I'm not certain about the brand of the mug, I'll check it and get back to you. Oh yum Mel! Pumpkin soup is the best. I've been terribly lazy and not had dinner - it is raining outside and I am absolutely craving this. A good one to make for the freezer for times like this I think! Pumpkins really make wonderful soup, don't they? Oh! You're absolutely right, it can be frozen to save some for a day when you're too busy to shop or cook and reheated in a flash. I hope you had a wonderful weekend. Mine was spent with Byron, visiting beautiful regions with green mountains and freshwater streams. We explored a dry creek bed to have a picnic, it was perfect! I'd love to catch up when you're down our way.